Now-days online shopping became very popular among people. Online market is developing very fast. There are many sites which gives you facility to buy thing which you need. But while doing online shopping people should be careful unless some time they have to face loss. Although online shopping make your work easy but it can also prove very dangerous to you if you do it carelessly. During the purchasing online you can use few important tips for online shopping safety which keeps you safe and avoid any kind of losses. Many times because of online shopping people have to face loss of money, any virus can come in your system or some time you may purchase wrong goods. 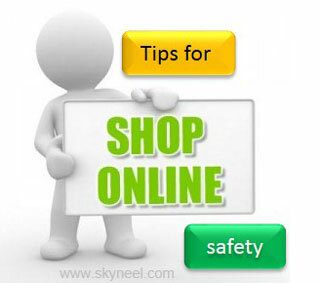 For secure online shopping here we will see some tips which should always follow while doing online shopping. If you do online shopping it is important that you should keep your browser always updated. This will make your system secure from viruses and it will save you from crash of browser while doing online payment. It will give you malware protection also. Internet Explorer: This browser itself update while windows update. Firefox: To update this browser you have to go in help menu which is in top left corner of screen. Now click on About Firefox option. From here you can know where your browser is updated or not. If it is not then go to settings and download browser’s updated version. If you are trying to do shopping from online retailer, always pay attention to its URL. Secured socket layer (SSL) should be used in web page. To check this see properly that on URL https:// should be used instead of http://. This will help you to surf on secure websites only. This software will protect your files from malware (kind of virus) which comes from online shopping portals. There are many software available on internet free which can be helpful for users to enhance the security of their systems like Gdata internet security, Norton internet security, Beet defender etc. For online shopping people should use only trusted websites like PayPal, Bill Me Later etc. These sites are made to online money transfer, online shopping or credit transfer. These website save user’s credit card’s data on secure server. For online shopping sites like Flipcart, Zabong, Amazon etc should be used which is trust worthy for shopping. If you are doing online shopping by mobile, you should be more careful because on mobile you can face more problems. Always use 3G or Wi-Fi for online shopping from mobile. If you use 2G you may face problems related to payment. Always use secured apps for this purpose. Never download any kind of app which you never heard. While doing online shopping by credit always check your credit card statement. Never wait for bill to month end. By doing this you can be saved from extra charges of website. You can check whether websites charged you more. I hope you like this online shopping safety guide from which you will be able to easily online shopping safety without any extra efforts. If feel any problem in this guide then please use comment box. Thanks to all.